This newsletter is intended to give parents an idea of what is being covered each six weeks in science and what their students should be learning. 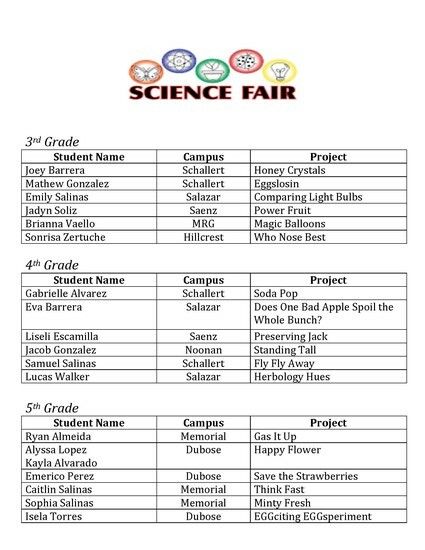 Please contact Erika Vasquez, Director of Instruction for Science, if you have questions. 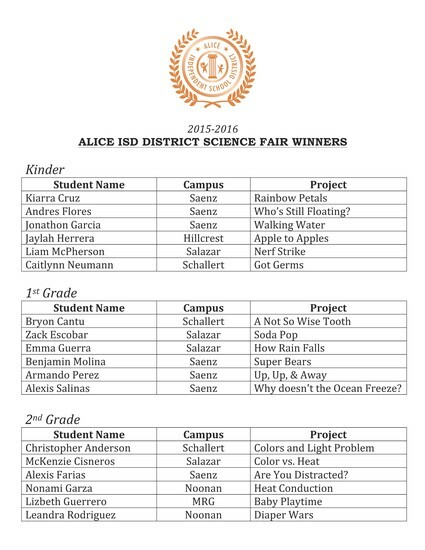 Congratulations to our District Science Fair Winners!! 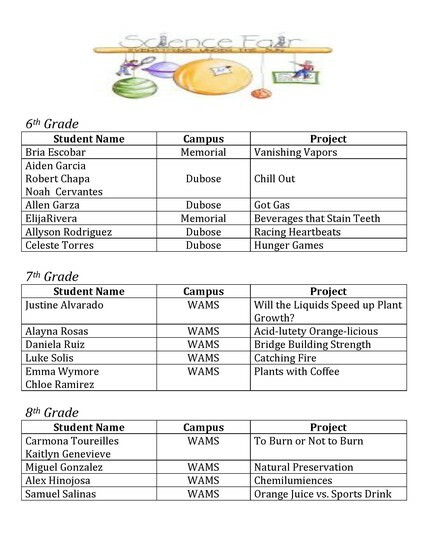 All participants will have a chance to compete at the Coastal Bend Science Fair held at the American Bank Center this six weeks. February 26th and 27th. Unit 6 Exploring Space- During this unit, students identify patterns associated with the changes of the appearance of the Moon, Sun, and stars and make illustrations as a way to record these observations. Students use their senses as a tool of observation to identify patterns, including day and night, and they identify day and night as an event with a repeating pattern. Students make predictions based on observable patterns in nature and record this data using pictures and words. In order to introduce the concept of events with repeating patterns, kindergartners make observations on a more formal level. Unit 06: Investigating Weather and Seasons- During this unit, students learn about tools to help them record information about weather, including relative temperature such as hot or cold, clear or cloudy, calm or windy and rainy or icy. An understanding of wind as moving air is addressed. 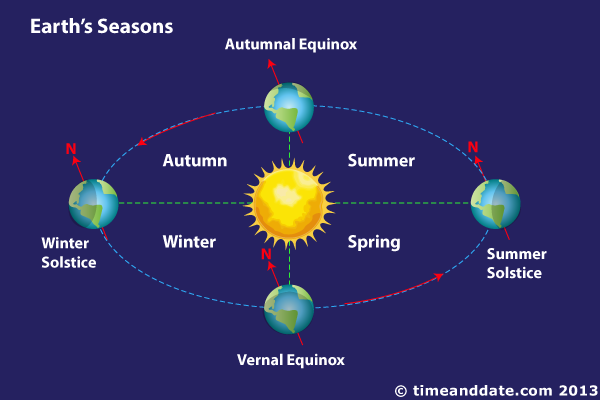 Students make predictions based on observable patterns, including identifying the characteristics of the seasons of the year. In accordance with TEKS 1.2E, students communicate their observations and provide reasons for explanations using student-generated data from simple descriptive investigations of the ways objects move, such as the appearance of clouds in the sky. Students record and organize data using pictures, words, and graphs (picture graphs, real-object graphs, or bar graphs). Additionally, students describe what scientists, such as meteorologists, do. This unit lays the foundation for careful observations and accurate recording of events in the natural world and provides students with experiences to make observations that will help them recognize patterns and changes over time. Unit 07: Investigating Objects in the Sky- During this unit, students observe and record changes in the appearance of objects in the sky such as the Moon, stars and the Sun. Students also identify characteristics of day and night. After making observations, students make predictions based on observable patterns. They record and organize the data in their science notebooks, using pictures and words. Unit 06: Patterns of Change: Weather- During this unit, students measure, record (using pictures and words), and graph weather information, including temperature, wind conditions, precipitation, and cloud coverage, in order to justify patterns in data. Experiences with graphing include pictographs and bar graphs. Students use appropriate weather instruments such as thermometers, wind vanes, and rain gauges to collect weather data. Additionally, students make weather predictions based on observable weather patterns. Finally, students identify what a scientist, such as a meteorologist, is and explore what meteorologists do. This unit adds to the foundation for careful observations and accurate recording of events in the natural world and provides students with experiences to make observations that will help them recognize patterns and changes over time. Unit 07: Exploring the Water Cycle- During this unit, students explore the processes in the water cycle, including evaporation, condensation, and precipitation, as connected to weather conditions. As students make predictions based on observable patterns in weather and the water cycle, they learn to make connections between the two phenomena. 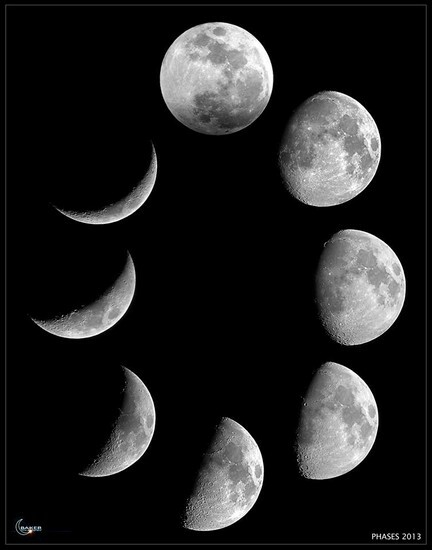 Unit 08: Patterns of Change: Observing the Sky- During this unit, students observe, describe, and record the changing pattern of the Moon and learn that this pattern cycles about every four weeks. In addition, students observe, describe, and record the changing pattern of stars. Students make predictions based on the observable patterns of the Moon and stars. Students continue to use the science notebook to record observations and data using pictures and words. Temperature – a way of measuring how hot or cold something is; temperature is measured using either the Fahrenheit (F) or Celsius (C) scale. Unit 05: Investigating the Natural World- During this unit, students build upon previous experiences with forces and properties of matter and apply those understandings to the study of the Earth as a system. Students learn about forces of nature that shape the physical features of the Earth. They examine changes due to rapid processes and slow processes. Rapid processes are those such as earthquakes, volcanic eruptions, and landslides. Slow processes are those such as the formation of soil. Students identify and compare landforms. In addition, students explore the properties of earth materials and learn to make informed choices in the use and conservation of natural resources by recycling or reusing materials such as paper, aluminum cans, and plastics. Unit 06: Investigating the Solar System- During this unit, students identify the planets in Earth’s solar system and their position in relation to the Sun. Furthermore, students describe and illustrate the Sun as a star composed of gases that provides light and heat energy. Additionally, students construct models that demonstrate the relationship of the Sun, Earth, and Moon, including orbits and positions and identify their limitations, including size, properties and materials. Students continue to communicate valid conclusions supported by data in writing, by drawing pictures within the science notebook, and through verbal discussion. Students also connect grade-level appropriate science concepts with the history of space science, space science careers, and contributions of scientists in the field of space science. 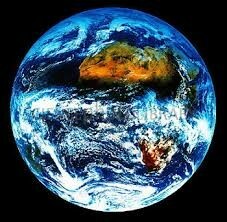 Natural resource – anything that people can use, such as minerals, water, plants, or soil, which comes from nature. Unit 05: Natural Resources- During this unit, students identify and classify the Earth’s renewable resources, including air, plants, water, and animals; and nonrenewable resources, including coal, oil, and natural gas; and the importance of conservation. Additionally, students make informed choices in the use and conservation of natural resources and reusing and recycling of materials such as paper, aluminum, glass, cans, and plastic. Students communicate valid, oral, and written results supported by data as well as construct charts to organize, examine and evaluate data. Students continue to demonstrate safe practices and the use of safety equipment as described in the Texas Safety Standards during classroom and outdoor investigations. Unit 06: Patterns of the Earth- During this unit, students take their exploration of weather a step further than in Grade 3 by using the weather data that they gather and applying it to the reading and creating of weather maps. Students measure and record changes in weather and make predictions using weather maps, weather symbols, and a map key. Students also extend their exploration of the water cycle through describing and illustrating the continuous movement of water above and on the surface of the Earth and explain the role of the Sun as a major source of energy in this process. Students represent the natural world using models and identify their limitations, including accuracy and size. Furthermore, students collect and analyze data to identify sequences and predict patterns of change in shadows, tides, seasons, and the observable appearance of the Moon over time. They construct simple tables, charts, bar graphs, and maps using tools and current technology to organize, examine, and evaluate data. Students continue to analyze data and interpret patterns to construct reasonable explanations from data that can be observed and measured, and communicate valid, oral, and written results supported by data. Unit 07: Sun, Earth, and Moon Systems- During this unit, students identify and compare the physical characteristics of the Sun, Earth, and Moon. 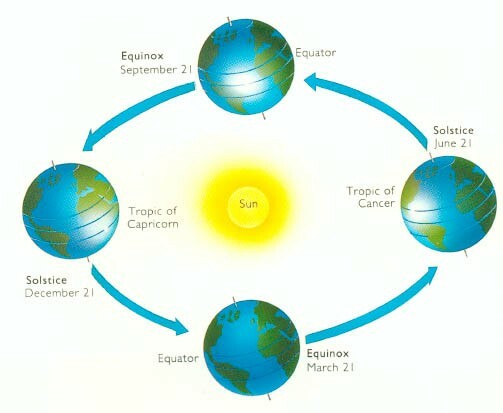 Additionally, students demonstrate that Earth rotates on its axis once approximately every 24 hours causing the day / night cycle and the apparent movement of the Sun across the sky. Students collect data by observing and making accurate measurements and construct simple tables and charts to organize, examine, and evaluate the data. Furthermore, students analyze and interpret information to construct reasonable explanations based on evidence. Students develop a model illustrating how Earth’s rotation causes the day / night cycle and the apparent movement of the Sun across the sky. Unit 08: Patterns in the Natural World- During this unit, students differentiate between weather and climate. This is the first time students have been introduced to climate and the concept is not revisited until Grade 8. Furthermore, students explain how the Sun and the ocean interact in the water cycle. Students continue to collect information by detailed observations and accurate measuring. Finally, they organize, analyze, and interpret information in order to communicate valid conclusions. Unit 09: Ecosystem Interactions- During this unit, students observe the way organisms live and survive in their ecosystem by interacting with the living and non-living elements. They draw or develop a model to describe how the flow of energy derived from the Sun, used by producers to create their own food, is transferred through a food chain and food web to consumers and decomposers. Students evaluate the accuracy of the information related to promotional materials for products such as nutritional labels. Additionally, students analyze and interpret information to construct reasonable explanations about the effects of changes in ecosystems caused by living organisms, including humans, such as the overpopulation of grazers or the building of highways. Furthermore, students identify the significance of the carbon dioxide-oxygen cycle to the survival of plants and animals. Students continue to demonstrate safe practices during investigations and utilize the science notebook to organize, examine, and evaluate information. Unit 07: Force and Motion- During this unit, students build on previous knowledge to relate the law of conservation of energy, in terms of potential and kinetic energy, to the study of force and motion. Students compare and contrast kinetic and potential energy; investigate the effects of unbalanced forces on an object’s position, direction, and speed; calculate average speed; and measure and graph changes in motion including distance over time and speed over time. They construct and interpret graphs in terms of speed, direction, and position. Students also investigate how inclined planes and pulleys can be used to change the amount of force used to move an object. Students compare the forces needed to move objects with and without inclined planes and by using different types of pulleys. Students demonstrate safe practices as outlined in the Texas Safety Standards. Unit 08: Solar System and Exploration- During this unit, students describe the physical properties, locations, and movements of the Sun, planets, Galilean moons, meteors, asteroids, and comets. Students construct models of the solar system in which a scale is used to represent the sizes of the objects and the distances between them. Students demonstrate an understanding of the role gravity plays in governing the motion of our solar system. Additionally, they explore the relationship between mass and gravitational attraction. Finally, students study the history of space exploration and make predictions about the future of space exploration. Unit 07: Structure and Function of Cells- During this unit, students further develop the concept that all living things are composed of cells and cells come from other cells by cell division (reproduction). Students differentiate between structure and function in plant and animal cell organelles through the use and development of models. They develop analogies of the structure and function of cell organelles to another system. Students demonstrate the ability to recognize levels of organization in plants and animals up to the organism level. Unit 08: Climatic Interactions- During this unit, students learn how the Sun provides energy that drives convection within the atmosphere and oceans producing winds and ocean currents, as well as addressing the role of oceans in the formation of weather systems. Students design, plan, and implement comparative investigations to enrich their understanding of convection and weather phenomenon. Students also identify how global patterns of atmospheric movement influence local weather using weather maps. Students use anemometers and are introduced to psychrometers. This is the first experience students have with ocean currents, such as Gyres. Additionally, this is the first time students revisit weather and interaction with the Sun since elementary grades. Unit 09: Earth Cycles- During this unit, students describe cycles influenced by the Sun, Earth, and Moon. Students model how the rotation of the Earth causes day and night and the Earth’s tilt and revolution causes changes in seasons. Students demonstrate and predict the sequence of events in the lunar cycle in relationship to the positions of the Earth and Moon relative to the Sun. Additionally, they relate the position of the Moon and Sun, relative to the Earth, to their effect on ocean tides. Students develop the understanding that some cycles, such as day and night and, phases of the Moon, are evident only by viewing them from Earth. Manipulating models enables students to correct misconceptions about these cycles. Unit 10: Light Years and Theories- During this unit, students model and describe how light years are used to measure distances and sizes in the universe. Students research how scientific data are used as evidence to develop scientific theories to describe the origin of the universe. They analyze, evaluate, and critique scientific explanations. Additionally, students research the contributions of scientists related to the development of theories about the origin of the universe. El Niño – period during which surface waters in the Pacific are unusually warm; impacts temperature and rainfall in the U.S.
La Niña – periods during which surface waters in the Pacific are unusually cool; impacts temperature and rainfall in the U.S.
Unit 08: Genetics and Heredity- During this unit, students learn about the regulation of gene expression and recognize that this expression is regulated by various mechanisms and at various stages in the protein synthesis pathway. They explore the importance of proteins in determining an organism's traits including growth, development, cellular function and structure. The relationship between cell differentiation and gene expression is examined. In this unit, students recognize the significance of meiosis and make predictions using Mendelian and non-Mendelian genetics. Students also recognize that disruptions of the cell cycle lead to diseases in the context of meiosis and the mechanics of genetics. Students also learn about the use of biotechnology to study genomes. Students analyze, evaluate, infer, and predict trends using data from various genetic combinations. Finally, students learn about the contributions of scientists, such as Gregor Mendel, to the field of genetics and recognize the advancements that have been made in this field in recent time. Unit 09: Evolution- During this unit, students analyze evidence for evolution and scientific explanations of that evidence. They also analyze and evaluate the mechanism of natural selection and its results. Students analyze and evaluate the unity and diversity of life as explained by evolutionary theory. More specifically, students analyze and evaluate various aspects of this scientific theory including evolutionary mechanisms, common ancestry, fossil record, natural selection, adaptation and the development of diversity. Students develop a deeper understanding of scientific theories as well-established and highly reliable but subject to change as new evidence is discovered using advances in technology. Much of this unit is spent analyzing and evaluating data and information related to evolution. Students use data collected from investigations / simulations to make calculations and predictions regarding related concepts such as allele frequency and population size. Evolutionary mechanisms – fundamental processes or natural phenomenon that are capable of altering gene frequency in populations and as a result are responsible for evolutionary change; these mechanisms include natural selection, mutations, gene flow, genetic drift, and recombination, etc.